What, you don’t have one of these? :) Storage galore, perfect for the, ahem, efficient workshop. 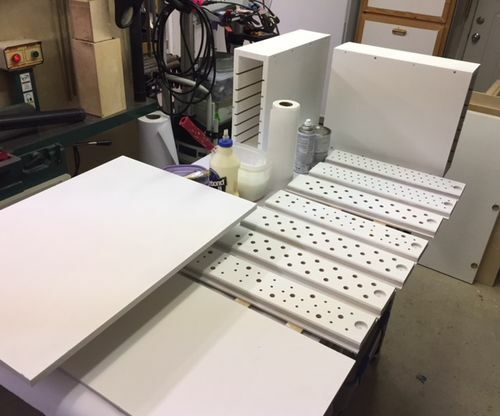 I bought the Kreg table as a clearance floor model from the Woodcraft and had plenty left over for the DowelMax lift which I really like. The instructions are a bit cryptic and it and it takes a little tweaking to fit the router depending on the model, but it ends up being a very simple solution that allows access to the underside without disrupting the fence set up. Since the Triton has a dust hood and connection surrounding the bit you don’t really need a dust port for the central box, but that is something that can be added if need be. I still need to mount the start/stop switch and drill a hole in the back for the dust hose access, but it is pretty much good to go. 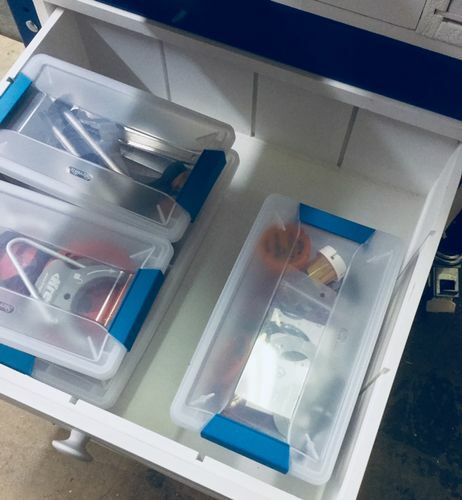 Oh, I also cut grooves in the bottom drawer for dividers but for now, I just used plastic storage boxes. And there’s plenty of room on each side for wrenches and other items. Oh yeah, one other thing, for the 1/2” shank bits I drilled a 13mm hole (1/2” = 12.7mm) which allows just enough room to easily insert and extract the bits. The blue white looks great and for me it just the right size, and if those are the casters I think they are, you got a winner!!! Trust me, Getting to see it in person will just make you all more jealous. You are making us all look bad Tim! Very impressive upgrade. I like white and blue color combination. It looks like a very impressive router table. Nice work! 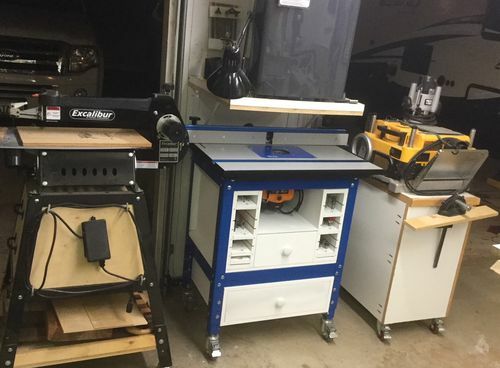 Great router table and very nice additions. Looks like you are good to go!